Place the onions and potatoes in the slow cooker. In a pan, heat butter over a medium-high heat. Cook the garlic and beef together until the beef is browned on all sides. Transfer to the slow cooker. Return pan to the heat. 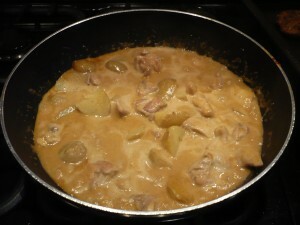 Stir in the coconut milk, curry powder and peanut butter and stir until the peanut butter melts. Pour into the slow cooker. Add the fish sauce and brown sugar and mix all together. Set the heat to either low for 6-8 hours or high for 4-5 hours and put the lid on. For the last ½ hour of cooking, switch to high and take off the lid. This will allow it to thicken slightly. Scatter the peanuts on the top and serve with either noodles or rice of your choice. This is a delicious curry and smells divine throughout the day. It was a hit with my husband, who likes thick, rich sauces. The amounts can be easily doubled.